It is a norm that white collars in Japan bring their own home-packed meal (bento) to work instead of eating out. Company may provide microwave in the pantry but it will take significant amount of time to wait for your turn to heat up the food. Thanks for Thanko innovative USB Lunch Bag that will keep to keep your food warm. The lunch bag comes with an integrated heater that is powered by a USB port. It is able to keep content warm at 60C while you are busy at number crunching. While having hot food, it is not a bad idea to get some chilling drink from its USB fridge. As a safety precaution, user should always make sure whatever bento box you put inside this bag meets the quality standard to prevent from harmful chemical that could cause potential health risk. 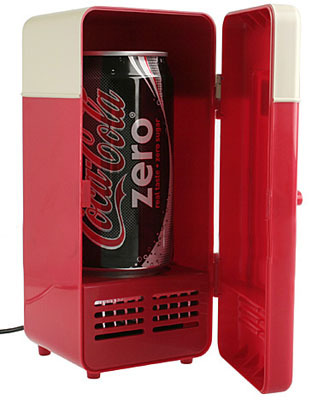 With USB Mini Fridge, you can indulge and refresh yourself with cold swigs of cola/beer. It is big enough to house a can of fav drink which needs only 5V USB Power. The can gets chilled very fast thanks to the temperature falling to 8.5 degrees in just 5 minutes of hooking it to the computer. It also features an internal LED light. The USB Mini Fridge from Brando costs $33.